Children’s Day… a day for the children and by the children! The children’s day signifies the commitment of the country towards the well-being and welfare of our children. 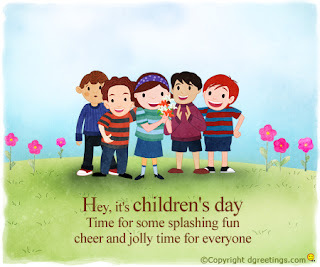 This day is celebrated with much fanfare and joy to revel the innocence and purity associated with childhood. It is known to all that the day is celebrated with fun activities and innovative sessions, especially organized for the children. However, the day is also marked by tremendous social endeavors undertaken by government and non-profit organizations for uplifting the well-being and social rights of the under-privileged children. Children’s Day is observed in India on November 14. The organization, on this day, promotes various well-being and developmental steps to bring improvement in the living condition and educational arena of the children all over the world. In addition, in many countries, Children’s day is well marked as the International day for the Protection of Children from mal-practices and sexual abuse. There are numerous theories supporting the reasons for commemorating this day, however, going by the Indian theory, the day coincides with the birth day of the first Indian Prime Minister, Pandit Jawaharlal Nehru, born on November 14, 1889. Pandit Nehru, more affectionately known as Chacha Nehru, was one of the most ardent propagators of the Indian freedom struggle against the Britishers. He was also known for his eternal love and affection for the country’s children. He fought for the educational and social rights of the children as he strongly believed that they are the future of our country. In many schools, Children’s day is celebrated like a grand festival. A wide range of fun-filled and educational activities are organized to make this day memorable and special for the children. For many children, the day is a great reliever from their mundane schedule of studies and gives a chance to rejoice their precious childhood. Some of the attractions of the day are foot-tapping music for the children, dance, feast and competitions of sorts organized by the school. The day can become memorable for the child with the participation of the parents. The parents can well take initiatives of organizing a small party for the children at home or at their favorite food outlet. Apart from gifts, words of appreciation and affection from the parents can do wonders to boost the morale of the children and bring them closer to their parents. It is in the last five years that the awareness of the children’s day has almost doubled all over the world. Thanks to the technology, the influx of affectionate SMSs and inspiring messages are reaching almost every mobile handset, thus leading to an increased awareness. The media too has been putting in commendable efforts to recognize and reach help to the disadvantaged children all over the world. With these unending efforts of media and other organizations, today, we can proudly say that each and every child of our country, nevertheless his class, is precious for the development of our country.